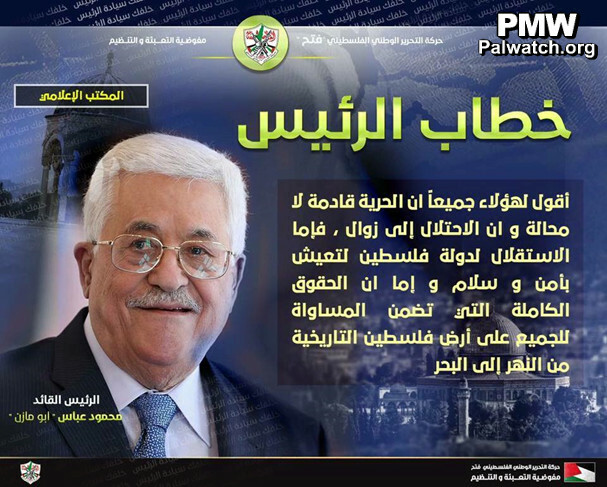 Fatah: Israel's coastal city Haifa is "Palestinian"
While PA Chairman Abbas and other Palestinian leaders speak internationally about Israel as an accepted fact, it should be noted that the PA and Abbas' Fatah Movement still have not accepted the most fundamental commitment the PLO made when it signed the Oslo Accords 25 years ago: To recognize Israel's existence. Such a recognition has never happened. "Palestine from the [Jordan] River to the [Mediterranean] Sea"
Behind the map are the names of different cities located both in Israel and in the PA areas, among them Israeli cities such as Acre, Jaffa, Be'er Sheva, and Haifa. The text and image leave no room for the State of Israel in any borders. For more than two decades, Palestinian Media Watch has documented that neither the PA nor Fatah recognize Israel when addressing their own people. In fact, the opposite is true. Both do their utmost to convince Palestinians that all of Israel was, is, and will remain "Palestine." It is not surprising that Palestinians deny Israel's existence, since the message that all of Israel is "Palestine" comes from the top. 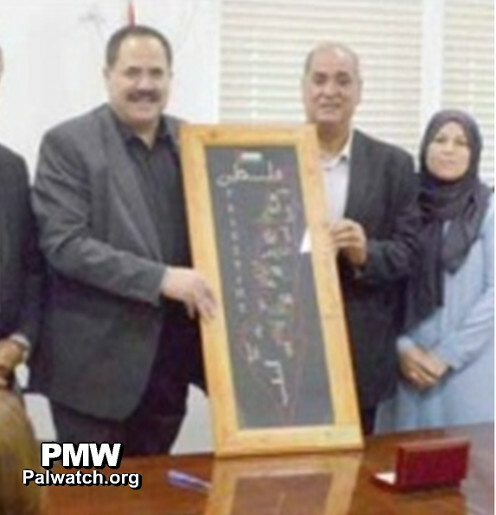 The Palestinian Authority Minister of Education Sabri Saidam recently posed holding a sketch of the PA's map of "Palestine" that likewise presents all of Israel as "Palestine" at an event with NGOs working with the education sector. 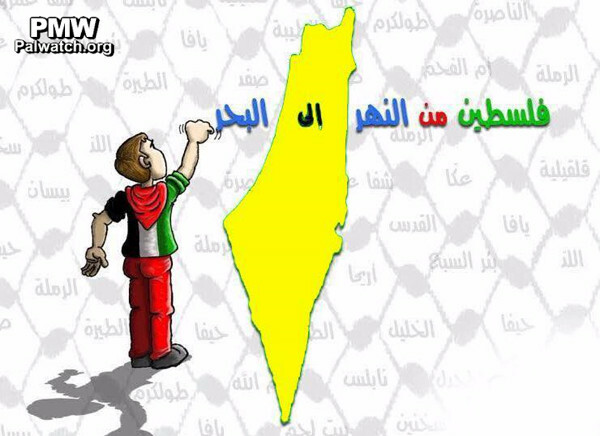 "Palestine" is written on the map in Arabic and English (on left). Saidam is also Deputy Secretary of Fatah's Central Committee. Not only is all of Israel presented as "Palestine," individual Israeli cities are said to be "Palestinian." 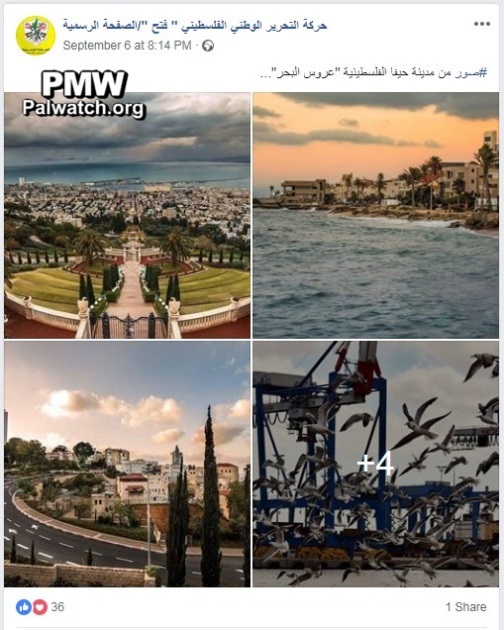 This photo collage posted recently by Fatah is entitled "pictures from the Palestinian city of Haifa, 'the bride of the sea." [Official Fatah Facebook page, Sept. 6, 2018] It is another example among thousands. shadow of a doubt, and the fate of the occupation is to come to an end. Status text for both images read: "Freedom will come, without a shadow of a doubt." Click to see review of Palestinian leaders' statements about the Oslo Accords proving that they never intended to reach peace with Israel. "The [PA] Ministry of Education and Higher Education, represented by [PA] Minister [of Education and Fatah Central Committee Deputy Secretary] Dr. Sabri Saidam, signed three memorandums of understanding yesterday [Sept. 22, 2018] for supporting the education sector in Palestine, including two agreements with the Teacher Creativity Center, represented by its director, Rifat Al-Sabah, and a third with the Women's Studies Center, represented by its director, Sama Uweida." The Teacher Creativity Center is a Palestinian NGO whose mission is "to contribute to a democratic Palestinian society that upholds human rights, equality and social justice." Among other things, it notes that it is "devoted to... mutual understanding, tolerance and friendship with all nations and all racial, ethnic or religious groups." It is a member of Alternatives International Federation, which states that it "brings together social and political movements struggling against neoliberalism, imperialism, social injustice and war," but also engages in advocacy against Israel. Michel Warschawski, founder of its Israeli member organization, Alternative Information Center, has said "One has to unequivocally reject the very idea and existence of a Jewish state, whatever its borders." The Teacher Creativity Center receives funding from the European Union and various international organizations. The Women's Studies Center is a Palestinian NGO that states that it is "a human rights organization that actively promotes gender equality and women's rights in Palestinian society." It engages in political activity including support of BDS and advocacy against Israel. It receives funding from the European Union and various international organizations.